How is the GCS supposed to know what to give the user as options? The GCS has no way to know what are the different options for Aperture, Shutter Speed, ISO, etc. The Basic Set should have instead abstract options. Something like "High", "Medium" and "Low" for ISO as an example. Same for Shutter Speed, It would be up to the camera to interpret those in any way it sees fit. If you want the UI to show the full range of options, you need to give the GCS something to work with. The current set of options for AE only make sense if you have full control over Shutter Speed and/or Aperture. If you don't have full control, Auto is the only option that works. And so it goes for the rest of settings currently defined. @dogmaphobic I propose you publish your latest json spec here as soon as possible and we have a round of feedback. This is just a draft, trying to come up with something that can be used. The idea is to use the same interface used for vehicle parameters. It expands on that by providing parameter exclusions, localization and different option limits based on parameter’s option selections. The file is grossly incomplete. It’s just a sketch to see if it’s worth going forward. I would need to implement this within the scope of real cameras to see what works and what doesn’t. It starts with a description of the hardware. The model of the camera, its hardware characteristics, definition file version etc. It then proceeds to list all of the settings (parameters) and their options. A list of rules defining what options are available given a current selection. That is, if CameraMode is set to Video, the valid ISO values (index) are listed. If VideoResolution is set to "3840x2160 30P”, the possible ShutterSpeed values are those greater than its fps (1/30 or faster). Set of mutually exclusive options. That is, if ExposureMode is set to Auto, setting Aperture and ShutterSpeed is not allowed. If set to Manual, EV is not allowed (disabled). Self explanatory. A list of the original text strings and their corresponding, localized strings in the given locale. "Video Resolution":         "Resolução de Video"
"description": "Camera usecase definition file"
"description":	"Depth Sensing and Vision Camera"
"Description" : "8MP Front Camera Image Capture"
"Description" : "8MP Front Camera Video Capture"
"Description" : "8MP Front Camera Video Streaming"
Interesting concept. I guess the end result will be a combination of all of the above. We have Video Streaming and Video/Photo capturing. Invariably, and by far more common, these are within the same camera. The stream shows what the camera sees so you can control it as a “Viewfinder” on a regular camera. Using these camera-usecases, how do you reconcile a camera that is used for both streaming and capturing? There are cases where you have a front facing camera (some times called FPV) and a cinematography camera. 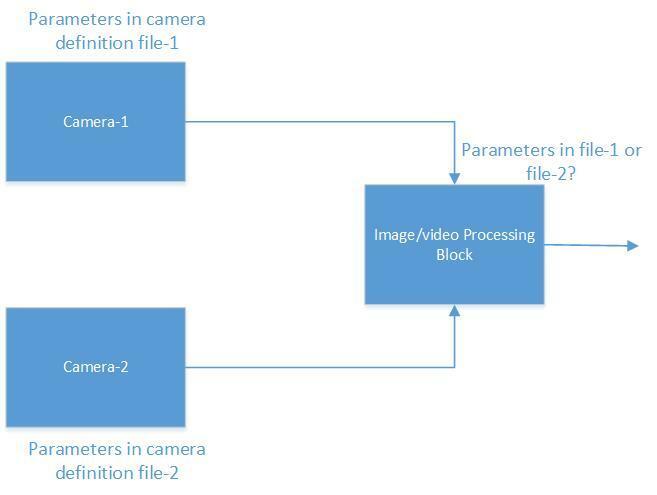 In this scenario you have two simultaneous streams but normally only the cine camera is used for capturing videos (and require all the camera parameter controls). There are other cases where one single camera produces two or more video streams. A thermal imaging camera will stream a “live” video and a “thermal” imaging video. You would then overlay both within the UI. Also, how do you handle rules and exceptions for parameters? We can discuss this further at tomorrow’s meeting. I’m a bit behind schedule on this. After talking to Julian and Don, I have a better grasp on the definition file (the Json file) but I have yet to come up with a mechanism to get/set these parameters. The original idea was to use the existing parameter protocol (PARAM_VALUE) but that does not gives us the responses we need (when compared to COMMAND_LONG). The idea is to come up with a new COMMAND_KEYVALUE_PAIR message, which would respond in the same manner COMMAND_LONG responds. That part I have not yet sorted out. In this case, both video and image capture will occur at the camera’s maximum resolution (or whatever manual settings is allowed by the camera using its own, hardware controls). It also means a few new bits of information will need to be added to the CAMERA_INFORMATION message. It should tells us if the camera is able to capture photos and/or videos. It should also tells us if these are exclusive of each other. That is, can it capture both but it is modal? If so we will need to use MAV_CMD_SET_CAMERA_MODE to set the desired mode. Most cameras allow capturing images when in video mode but not the other way around. This information will also need to be added to this bitmap to tell us if we are allowed to start/stop video recording when in photo mode (or start/stop still capture when in video mode). If a camera definition file does exist, the GCS will load it and build its UI based on the information provided within. The GCS loads the file, immediately performs all the localization replacements if that is available and/or needed and hold in memory a class responsible for controlling/setting the camera. That includes changing the available settings and options based on the rules and limits described within the definition file. The next step after the file is loaded, parsed and validated is to request from the camera all the parameters so the GCS can update the current values. At that point the GCS is ready to display the UI to the user. Once the user changes a value, the GCS will use a command to send it to the camera and it will expect an ACK from the camera to know if the value was received and accepted. The command used to send to the camera is included in the definition value along with the possible options for each command. The definition file starts with a set of constants describing the camera. It proceeds to list all the parameters available along with their possible options. In addition, it list rules for limits and exceptions depending on how certain parameters are set. It ends with a list of strings used for localization. The oddball item in the file is the videoStreams section. This is an optional section and I only listed here because I run into a situation where a camera has two streams that must be overlaid on top of each other. This videoStreams section allows to define how this is supposed to work. It gives the URL for each stream, it tells us these are not “exclusive” streams and it tells us the order in which they are to be overlaid. In all other scenarios, streams are exclusive. You normally only have one stream running. In those cases, you don’t need to define them in this file. You use the existing set of MAVLink messages to discover/define/start/stop them. In other words, if the videoStreams section is not included, the GCS will use the Video Stream set of messages to handle video streams. The idea is to use the PARAM_SET/PARAM_VALUE interface for getting/setting camera parameters. The issue is that currently, there is no proper ACK response when using that protocol. Here is a suggestion for an Extended version of PARAM_SET/PARAM_GET for discussion. Example messages abbreviated to only relevant fields. Similar changes to PARAM_REQUEST_LIST, PARAM_REQUEST_READ, etc. 3 commits changed 1 files with 59 additions and 39 deletions. 3 commits changed 1 files with 50 additions and 0 deletions. In my discovery code (within QGC), I send a MAV_CMD_REQUEST_CAMERA_INFORMATION command to any heartbeat I see other than from the autopilot, which doesn't seem too kosher. I agree that we should probably limit to a known set of component IDs. On the other hand, by not limiting the listening to heartbeats to a preset set of component IDs, anything that responds to a MAV_CMD_REQUEST_CAMERA_INFORMATION gets added. New, XML camera definition. This is already being parsed and all functionality defined within is done within QGC. Now I need to get the parameter protocol working so I can actually communicate with the camera(s).